With this tour we will discover the beauty of the fjords and the spectacular norvegian landscape from the slope of a mountain, and we will come into contact with the glaciers and their activity. We leave the port of Olden to begin our adventure along the enchanting Nordfjord, where the mountains drop dramatically into the ocean, transforming their water into foaming waterfalls. Along the way, the breathtaking mountain landscape is dotted with tiny mountain huts and orchards. We come to Mount Utvik, where we'll make a photo stop to immortalise the stunning panorama below. Back down the other side of the mountain we find the fascinating, green Våtedalen valley, studded with peacefully grazing sheep and goats. Our journey now takes us along a lake and through a tunnel to the Bøya glacier descending steeply down the mountain. This is just one arm of the more imposing Jostedalsbreen glacier, the largest on mainland Europe. We'll stop here and those who so wish may walk to the glacier lake to take photographs. Our break over, we continue across the lush, flat valley of Fjærland, surrounded by majestic peaks on three sides. 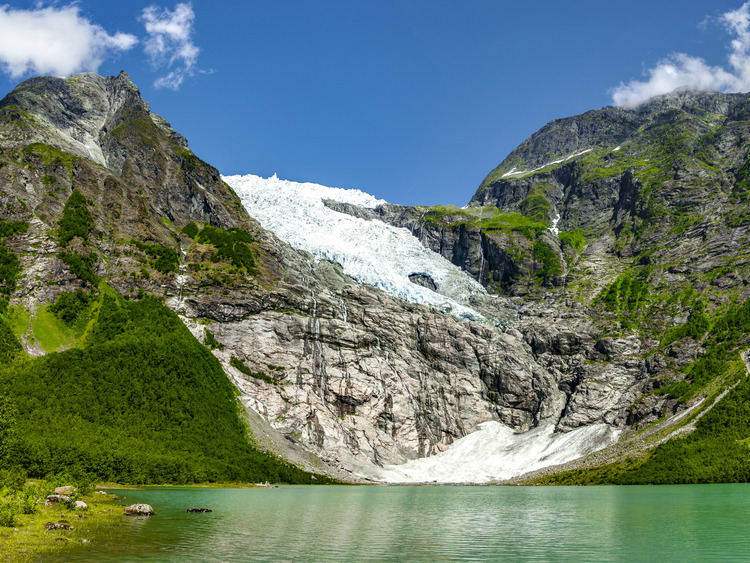 It is home to the Glacier Museum, which provides endless information on these spectacular natural formations, including videos of some excursions. It even allows you to get a first hand experience by simulating ice caves and crevasses. Our museum visit at an end, we go back to the Nordfjord and return to Olden.